(Nanowerk News) A team of researchers at MIT and Pennsylvania State University has been developing a new method for producing novel kinds of membranes that could have improved properties for batteries, fuel cells and other energy conversion and storage applications. After years of working on a novel way of making membranes through a unique layer-by-layer assembly, the team has developed a material specifically designed for the needs of advanced fuel cells — devices that can convert fuel to electricity without combustion, thereby avoiding the emission of any pollutants or greenhouse gases. This material has now undergone laboratory testing to determine its actual properties, which confirm the predictions and show the material’s promise. The results were recently reported in the journal Chemistry of Materials. 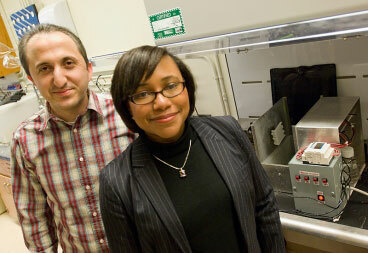 Postdoctoral researcher Avni Argun and professor Paula Hammond in the lab where they developed new technology for making fuel-cell membranes. Electrolytes, used in both batteries and fuel cells, are materials that contain many ions (atoms or molecules that have a net electrical charge), making it easy for an electric current to flow through them. In both batteries and fuel cells, this material is sandwiched between two electrodes — a positive electrode (called the cathode) on one side, and a negative one (called the anode) on the other. In a battery, that’s all there is, but in a fuel cell there are channels on each side, carrying a fuel (usually hydrogen or methanol) over the anode, and oxygen or air over the cathode. That enables fuel cells to keep producing electricity indefinitely, as long as there is a supply of fuel and air. In a fuel cell, the electrolyte membrane also serves a second function, to keep the fuel on one side of the cell from migrating across to the other side. Such migration contaminates the cell and can lead to a significant drop in efficiency. One big advantage of the new membranes produced by the MIT-developed process is that they are especially good at blocking the migration of methanol fuel. Direct-methanol fuel cells are considered a promising clean-energy source because they efficiently convert fuel to electricity without combustion, so they don’t emit any pollutants to the air. And unlike the hydrogen used for some fuel cells, methanol is a liquid that is easy to store and transport in conventional tanks. The basic layer-by-layer system for making the membranes works like this: a substrate, such as a sheet of glass or metal, is dipped into a bath of solution that deposits a layer on the surface. It is then transferred to a second solution, which deposits a layer of a different material, then back to the first bath, and so on. The thicknesses of the layers can be controlled at the nanometer scale, and the layers bond tightly to one another because of electrostatic forces. At the end of the process, the multilayer coating can then be peeled off the substrate with tweezers, or left in place. The researchers say this approach can produce materials that could not be made by other presently available methods. Svetlana Sukhishvili, professor of chemistry, chemical biology and biomedical engineering at the Stevens Institute of Technology in New Jersey, says “In my view, the technology is very promising and highly suited to integrate the two potentially conflicting yet crucially needed properties — mechanical strength and high ionic conductivity — in a single polymer material.” Sukhishvili, who was not involved in the research, calls this approach “a significant breakthrough” for the production of fuel-cell membranes. Tests showed that when alternating two kinds of polymer coatings with different properties, the resulting membrane had properties intermediate between the two polymers, including how easily ions could move through it. One potential advantage of such a system is that it could produce electrolytes that are firmly bonded to the fuel-cell electrodes on either side of them. In conventional fuel cells, the three parts are made separately and then pressed together, and these bonds can be a source of inefficiency. With the new process, the membrane could be formed directly on the electrode, creating a uniform and highly controlled membrane-electrode assembly. By improving the efficiency of the system, it should be possible to reduce the amount of platinum needed in the electrodes — a major contributor to the current high costs of fuel cells. The group, which also includes undergraduate student Marie Herring, as well as J. Nathan Ashcraft PhD ’09, and two researchers from Penn State, is in the process of licensing the process to a membrane manufacturer, DyPol, that hopes initially to produce membranes for laboratory research, and ultimately for commercial production. “Any promising result we see in the lab can be adapted very quickly for production,” Argun says. The layer-by-layer method was originally developed as a method for applying coatings to other materials. “Three years ago, we never thought this would be a viable method for making membranes,” Argun says. While the new membranes still need to be tested in actual fuel cell assemblies, the team is optimistic; “we are more focused now on using this process as a membrane-producing technology,” he says. And in addition to fuel cells, they could also be used as electrolytes in advanced batteries and solar cells, he says. Hammond says the technology can be very quickly scaled up to produce coatings for membranes for fuel cells. Ultimately, she says, membranes produced by this method “have the potential to outperform Nafion,” the material currently used in such cells, because of their improved impermeability to methanol. "This layer-by-layer approach may allow for the rapid synthesis of membranes with unique properties,” says John Muldoon, a researcher in the materials research department of the Toyota Research Institute of North America. He adds that it may find a wide range of applications, including in such areas as drug delivery, gas separation, and electrochemical devices such as solar cells, batteries, and fuel cells. But some work remains to be done to make these functions practical, he says: “When applied in the fuel cell, the current technology seems to have the advantage of low fuel crossover” — that is, leakage of methanol through the membrane. “However, its conductivity will have to be dramatically improved to have any practical value in fuel cell application. "